Over 250,000 dogs and cats go missing very year. Your best chance of recovering your missing dog is during the first 48 hours - so act promptly. 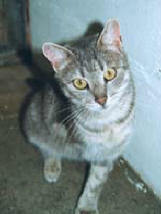 A 'street cat' rescued from Kusadasi in Turkey in 1999. Kushi's leg had to be amputated when she was found caught with her leg in a trap. Go to your police station immediately and give details in writing of your missing dog's breed, size, colour, and special markings. Ask for your report to be circulated to neighbouring police areas. Reports of found dogs are circulated immediately. Go to the RSPCA kennels and PDSA, give them the same details as you have given to the police and ask to see every dog in the pound - a description may not be sufficient to identify a dog. In order to avoid overcrowding it may be necessary for a pound to destroy animals after seven days so visit at least twice a week and take a photograph of the animal with you. Ask the police for the name and address of the dog warden. Take him a description of your missing dog, and if possible a photograph. Search your neighbourhood thoroughly. Call your dog loudly and listen for a reply. They may be trapped somewhere and be unable to get to you. 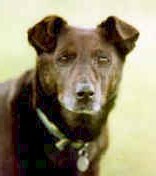 A distressed dog may hide for days or even travel lon distances (Cats often hide and have been known to hide in car boots and be taken from the area inadvertently). Advertise in your local paper. Watch the 'Found' advertisements. Pin up a notice on your own front gate, in shop windows, on trees near bus stations, and perhaps the local radio station will be prepared to broadcast a description of your missing dog. Ask your milkman, postman, paper boy or dustman to look out for your dog. Show them a good photograph. 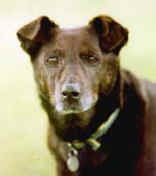 Lost dogs are sometimes taken home by the finder after registering a description at the police station. After one month, the dog becomes the property of the finder. Ask local schools to ask the children to look out for the animal. Contact the refuse department in case the animal has been killed on the road. Contact your local veterinary practices - an injured animal is usually taken to a veterinary surgeon for treatment to avoid unnecessary suffering, but remember it is not always possible to give extensive treatment or to nurse the animal afterwards unless the owner is traced to authorise the treatment and the cost. If in the Nottingham & Nottinghamshire area contact the "Animal Accident and Rescue Unit" on 0115 9231555, this group takes injured animals to vets for treatment. Your dog should always wear a collar properly secured (so that it cannot be slipped in emergencies) together with an identity disc. Even the most careful, devoted owner and most devoted, well trained dog may become separated. When a cat goes to a new home, it's advisable to keep the cat in the new home for at least 4 weeks, if they are let out before this time, they could get lost. Kittens shouldn't be let out till about 6 months old. More animals get stolen at night, so it's best not to let cats out after dark if possible. Cats should only where the type of collars that have elastic, so that should the collar get caught it will stretch enabling the cat to get it's head out of the collar and not get strangled. A small disc, with address and phone number, should be attached to the collar.